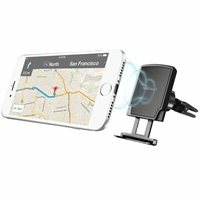 The Macally Magnetic Car Air Vent Phone Mount Holder features a super-strong Neodymium magnet that is secure and safe. Four different metal plates are included (circle, rectangle, heart and diamond). 4.50" x 4.00" x 4.50"